For two months this fall, Zuccotti Park, squeezed deep in a canyon between bankers’ skyscrapers in lower Manhattan, was the site of an extraordinary political action. Home to the hundreds of anti-capitalist protestors who camped there overnight, and the thousands who visited to join the protest, the park became a magical place: a communion of sharing and consensus in the heart of a citadel defined by greed and oligarchy. In the early hours of Tuesday November the 15th the occupiers’ camp was destroyed when police swept suddenly into the square, tearing down the tents, library, kitchen and medical center, and arresting hundreds. For the multitude supporting the action it was a heart-rending moment. But if the occupation at Zuccotti was destroyed that night, the movement it spawned across America has only just begun. Issues of equality and democracy, absent from mainstream political discussion in the United States for decades, are today springing up everywhere. Now, in a new book assembled by a group of writers active in support of the occupation, the story of Occupy Wall Street is being told. Occupying Wall Street draws on extensive interviews with those who took part in the action to bring an authentic, inside-the-square history to life. In these pages you will discover in rich detail how the protest was devised and planned, how its daily needs were met, and how it won overwhelming support across the nation. In a vivid, fast-paced narrative, the key events of the occupation are described: the pepper spraying of young women corralled between plastic fences by the NYPD; the mass arrests on the Brooklyn Bridge; the victory on October 14th when an announced “clean up” of the square was abandoned by a mayor’s office fearful of a PR disaster; and the eventual storming of the occupation that brought it to an abrupt end. Woven throughout are stories of daily life in the square focusing on how the kitchen, library, media center, clean-up, hospital, and decision-making at the General Assembly functioned, all in the words of the people who were there. The future course of Occupy Wall Street remains unclear. But one thing is starkly evident: Under the banner “We are the 99%” the protest has given birth to America’s most important progressive movement since the civil rights marches half a century ago. This is the story of that beginning. Writers for the 99% is a group of writers and researchers, active in supporting Occupy Wall Street, who came together to create this book. A list of all those contributing will appear at the back of the book. 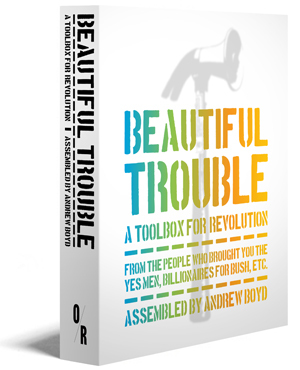 All profits from this book will be donated to Occupy Wall Street. If the Zuccotti Park encampment was “semireligious,” as Rolling Stone magazine said that many in the park described it—and “a spiritual insurrection,” according to Adbusters editor Micah White, then one of the occupiers’ most holy acts was visiting the kitchen to get breakfast, lunch or dinner. Heather Squire found her calling among the pizza boxes, the peanut butter and jelly, and the lines of OWS sleepers and day trippers, hands outstretched, waiting to be dished up a meal. Arriving at Zuccotti for the first time on October 1, Squire, 31 years old and with a BA in sociology, said she’d spent the four years since graduation filling out applications for entry level jobs sometimes directly, but more often only vaguely, related to her degree. She’d gotten nothing, and her most recent job had been as a $150­a­week deliverer of sandwiches. In the park she recalled that she knew a lot about food: since age 14, she’d worked in restaurants, as a server and in the kitchen. She joined the OWS Kitchen Working Group. In those early days, according to Heather, kitchen workers mostly opened boxes and washed dishes. But the impromptu nature of donations and deliveries made things touch and go. “WE NEED LUNCH!” one Kitchen Working Group tweet entreated. “SEND #OCCUPYWALLSTREET food!” WE’RE HUNGRY!” The occupation began giving the kitchen a budget of up to $1,500 a day for supplementary catering. Some volun­ teers started cooking in their own, small apartment kitchens. This was necessary because park rules forbade the use of flames to prepare food, and electrical power in Zuccotti was severely restricted. The Zuccotti kitchen staff could slice and dice some farm donations—cucumbers, lettuce, carrots—and make cold salads on site. But Heather wanted to cook the squash, grain and meat, and to use the dairy products without worrying about spoilage. If the kitchen could cook this food, OWS could reduce cater­ ing costs and use the savings to reimburse the farmers. Heather began looking for a commercial kitchen with cold and hot stor­ age. Out of the blue, a man named Leo Karl showed up at the information desk. Leo is pastor of an evangelical church and director of Liber­ ty Café, a soup kitchen in East New York, a poor neighborhood in Brooklyn. Every weekday morning, Liberty Café cooks nutri­ tious, savory lunches for hundreds of poor diners. Leo volun­ teered to make available the café’s huge, well­equipped kitchen in the afternoon, so that OWS could prepare dinner. Serious foodies were at this point becoming involved in the kitchen. One was Eric Smith, a former chef at Manhattan’s Mid­ town Sheraton hotel. Eric had been laid off, and he volunteered his culinary skills to OWS, as well as his experience cooking for very large groups. Erin Littlestar, meanwhile, had been prepar­ ing to be a chef but changed her plans. She told The Huffing- ton Post she’d been scheduled to matriculate at the National Gourmet Institute, but never showed up to start classes after she spent a day in Zuccotti. “I just got this feeling like there was something bigger I was supposed to be doing than just going to school to learn chiffonade,” Erin said. The New York Post, with typically snide hostility, ran a front page on a “typical” Occupy dinner, prepared in Brooklyn: organic chicken soup with root vegetables, parsley, rosemary and thyme; salad made with sheep’s­milk cheese and chimi­ churri sauce with a dash of garlic; spaghetti; brown rice; beans; and for dessert nuts and banana chips donated by a co­op in Ithaca. Mocking the menu as snobbish, the Post overlooked two things. For one, the Brooklyn soup kitchen was serving poor people food similar to the OWS menu. And back at Zuccotti, OWS fare went not just to those long­familiar with goat cheese. The kitchen was feeding many far less affluent people. Including the homeless. By late October, the kitchen working group was feeling overwhelmed by how poorly organized they were relative to the immense job they faced every day. Among the difficulties: a second prep kitchen had opened in Brooklyn, but assigned driv­ ers sometimes didn’t show up at either kitchen, so the food sat and spoiled. Heather, and other Kitchen Work Group members, wanted desperately to regroup and fix things. In the end, meal times were restricted, and diners had to stand in a long, snaking line to get their food. After the three­ day “simplification,” the food returned to being as tasty and healthful as ever. And everyone ate. At around 4 o’clock in the morning on November 15, Heather and two co­workers locked arms and sat down on the ground in a puddle of mustard and vinegar that had spilled from bottles smashed by the NYPD during that night’s eviction. They had spent their time at the occupation cooking, serving, and washing dishes, then cooking, serving, and washing some more. They were heroes of the kitchen, and perhaps appropriately, the last people in the park to be arrested.